Oh, hello there, Puratchi Thalapathy. 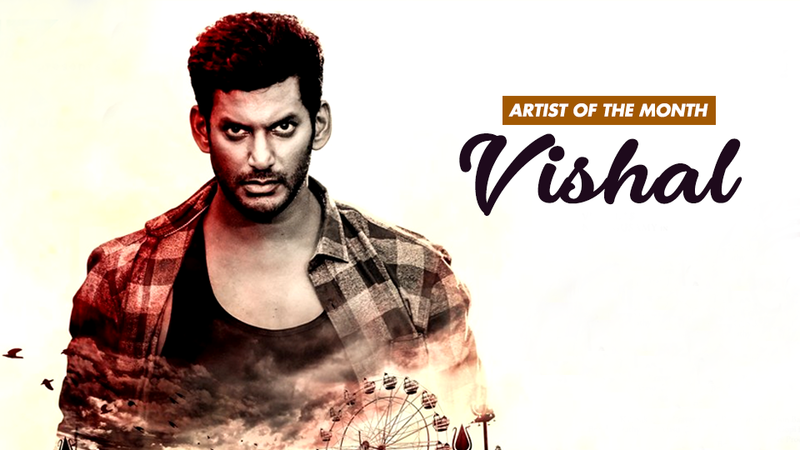 It’s November and Vishal Krishna has been honoured with RAAGA’s Artist of the Month title! The man is a Jack of all trades. Not only is he a prominent lead actor in Tamil cinema, he’s also a film producer at Vishal Film Factory, the President of the Tamil Film Producers Council (TFPC), and an anti-corruption activist! Vishal’s story began 41 years ago when he was born on 29 August 1977. His father is well-known film producer, GK Reddy, and so is his brother, Vikram Krishna. He studied Visual Communications at Loyola College, Chennai, and made his first entry into the Indian film industry as an Assistant Director for Action King Arjun’s Vedham. He made his first onscreen presence in Chellamae (2004), a romantic thriller movie, which made him popular amongst female fans. This was followed by several hits: Sandakozhi (2005), Thimuru (2006) and Thaamibarani (2007). However, a bad spell hit—his movies didn’t do too well for some time after that. After this string of flops, Vishal decided to create his own production studio, Vishal Film Factory. He managed to bounce back with profitable ventures such as Pandiya Naadu (2013) and Naan Sigappu Manithan (2014) under his banner. 2017 was a game-changer in his career. In April 2017, he was re-elected as the President of TFPC. He also amazed his audience with a brilliant portrayal of a detective in Thupparivaalan (2017) and as a furious army officer tackling cybercrimes in Irumbu Thirai (2018). As of last month, Vishal has expanded his career to be a reality show host! He’s now one of the faces of Sun Naam Oruvar, a programme that gets celebrities to participate in activities to raise funds for the needy. So far, the celebrities that have appeared on the show include: Karthi, Keerthy Suresh, Soori and Andrea Jeremiah. Is there anything Vishal can’t do? !